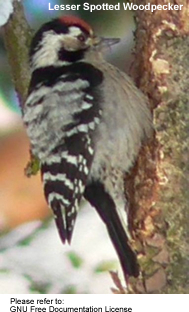 a member of the woodpecker family Picidae. The genus is sometimes incorrectly spelt as Dendrocopus. The range of the Lesser Spotted or Barred Woodpecker is palearctic, but several subspecies are recognised. From its small size and its habit of spending most of its time in the tops of tall trees in woods and parks, this little woodpecker is often overlooked, but if sighted on a trunk it may at once be identified by the broad barring on the wings and narrower bars across the lower back. At night it roosts in old holes. The male has a crimson crown, a brown forehead, a black curving streak above the eyes (known as superciliary stripe), and another from the base of the bill to the neck. The nape and upper back are black, but the lower back is barred with black and white. On the wings are broader and more conspicuous bars, and the outer tail feathers are also barred. The under parts are white with streaks on the flanks. The bill and legs are slate-grey. In the female the crown is white, but the young birds of both sexes have more or less crimson on the head. There are no marked seasonal changes. Its habits are very similar to those of the Great Spotted Woodpecker, and it has the same stumpy appearance, almost triangular, when bounding from tree to tree. Its note is a repeated "keek", loud for so small a bird, and its vibrating rattle can with experience be distinguished from that of the larger species. This substitute for a song may be heard at all times, but most frequently when courtship begins early in the year. Its insect food is similar to that of the Great Spotted Woodpecker. When hunting for wood-boring larvae it chips away at the rotten wood, and the litter at the foot of a tree is often the first indication that insects are attacking upper branches. A litter of chips is also a guide to a nesting hole, for the bird does not always carry these away when excavating. The hole is usually at a considerable height above the ground and may be so high as 30 or 40 feet. It is a smaller burrow than that of the Great Spotted Woodpecker, measuring from 1 to 2 inches in diameter. The shaft varies, the nesting cavity being often a foot or more below the entrance. Five to eight highly polished white eggs are laid upon wood dust and chips in the latter half of May, and a single brood is the rule. Both birds help to incubate. Occasionally an old or natural hollow is used or enlarged.